I will never be smart. I’m riding the Soma Double Cross on Tramway this afternoon and on the speedy big-ring drop to Interstate 25 I suddenly hear this high-pitched whine coming from what I’m certain is the front wheel. Sounds like a brake shoe rubbing up against the tire, or maybe Jimmy Olsen’s watch calling Superman. Zee zee zee zee zee. As this can only end badly on a fast descent, I stop — not once, not twice, but three times — to try to diagnose the problem. No joy. But then, as I turn around at the bottom for the climb back up, the noise stops. Well, OK, then. Ain’t much bad can happen to me at 10 mph. So on I pedal in blissful ignorance. Until I shift back into the big ring, get out of the saddle to stretch, and hear it again — zee zee zee zee zee. A light bulb sputters on, about a 20-watter. I’m running the biggest tires this bike will take, 700×38, and I bet the rear tire is heating up and expanding and rubbing up against the front-derailleur mech. Genius! The Double Cross doesn’t have one of those bulky new Shimano mechs that intrude into the rear triangle the way the NSA does into your life. It sports a svelte old Ultegra model. And, as I found when I got home, it also has a front-derailleur cable that somehow got itself bent inward, and the cable cap was rubbing the rear tire whenever I shifted into the big ring. So if you’re ever riding with me and wonder what the funny noise is, don’t worry — it’s just the air leaking out of my head. This entry was posted on January 18, 2015 at 5:12 pm and is filed under Bike stuff, Stupidity. You can follow any responses to this entry through the RSS 2.0 feed. You can leave a response, or trackback from your own site. A day of riding with a mechanical is better than not riding at all. Surprised Comrade Obama hasn’t mandated you trade that 20 watter for a euro-spec, UN-approved LED. I would snicker, but I accidentally once rode with a size 25 tire on the rear wheel of my fairly new shiny carbon road ride. I had actually asked for a 23 at the bike shop. They handed me the tire and I didn’t notice. Later that week on a ride, it rained unexpectantly. The bike stopped moving forward…at all. I got pretty wet while trying to figure out why. The bike had picked up some dirt and clogged the sliver of an opening between wheel and frame. Promptly got that fixed and vowed to always double-check the tire size. Felt really stupid. A little chainring that rubbed the chain against the cage only when under load, at least whatever load I could manage up the hill from Brown Canyon Ranch, had me searching for the source of the noise. Took me months to figure it out. I had a customer once with the same, but opposite, problem: the front derailleur wire was bent outward so while in the little ring every time the crank arm came by…tick…tick…tick. I think I caught that one just before pulling the bottom bracket. Other favorites: customer complained of a rattling noise while cornering; turned out to be the front wheel reflector. And an impossible to find creaking noise while climbing out of the saddle that, after literally a couple months of searching, turned out the to be the replaceable rear derailleur hanger. Life would be so much simpler if we could just learn to ignore those little noises that foretell of impending doom. My favorite was chasing a noise from the front end of a client’s bike, only to find it was caused by the crappy (but major name brand) front skewer letting the wheel “walk” in the dropouts under side loads. Came close to throwing the damn thing into the weeds when I finally figured it out after taking apart and greasing the entire headset/handlebar/stem assembly! Only putting a “hand of death” force into closing the thing would silence it. Of course I suggested another brand (the company whose founder invented the thing) of skewer be installed when he returned home. Now that’s the first thing I check when trying to get rid of snaps, crackles and pops. 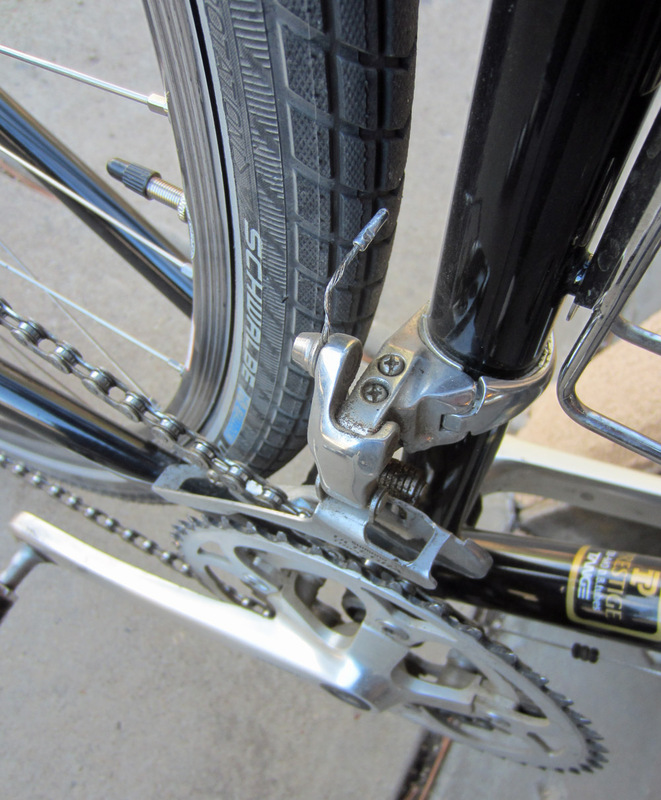 Plus, the way that cable end is bent, it pulls itself inward towards the tire with the normal tire rotation. You should have ridden in reverse whenever you were in the big ring….